And I’ll bet there’s one in your kitchen, too. This goes back and forth, back and forth until, finally, the man picks up the snake, tucks him into his coat and carts him off someplace nice and warm. Upon arrival, our village idiot budding herpetologist puts the snake down, expecting some kind of snaky high-five. Instead, the snake bites him. “Dude! Not cool! You gave me your word you wouldn’t bite me!” says our guy. Playing with fire. Tempting fate. Having a tiger by the tail. Walking down the snack aisle. All expressions of voluntarily putting oneself in a dangerous position – or they should be. Yesterday, I baked some yellow mini-cupcakes to take to a barbeque. 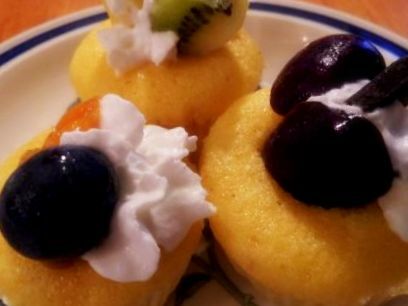 As far as cupcakes go, they weren’t all that bad – yellow cake, hollowed out a little to hold various sliced fruits, dark chocolate, and/or whipped cream. Devoid of icing, they were a better choice. Still, let’s not kid ourselves here: they were cupcakes. They are nutritionally bankrupt food fine for a celebration, but not to have hanging around my kitchen like I do this morning. There is a snake on my countertop and it is shaped like a cupcake. To a nicotine addict, cigarettes are dangerous. To a sugar addict, snacks are just as deadly. As I’ve said before, I do not keep them in my house…I can’t. I have lost a lot of weight, yes; however, I still have food issues and the smartest way for me to deal with them is to control my exposure to them. I can’t eat what I don’t have. And if I choose to keep things like the cupcakes in my house, then I’m just asking to get bitten, after all, I knew what it was when I picked it up. And you don’t mess around with Betty Crocker.